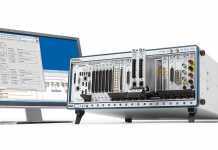 Analog Devices, Inc., which recently acquired Linear Technology Corporation, announces the LTC2992, a wide range I²C system monitor that monitors the current, voltage and power of two 0V to 100V rails without additional circuitry. 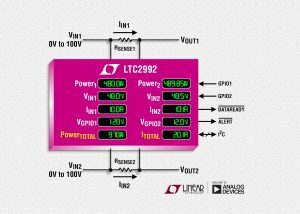 The LTC2992 has flexible power supply options, deriving power from a 3V to 100V monitored supply, a 2.7V to 100V secondary supply, or from the onboard shunt regulator. 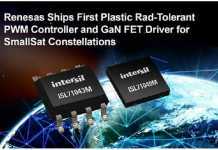 These supply options eliminate the need for a separate buck regulator, shunt regulator or inefficient resistive divider while monitoring any 0V to 100V rail. The LTC2992 is a simple, single-IC solution that uses three delta-sigma ADCs and a multiplier to provide 8- or 12-bit current and voltage measurements and 24-bit power readings. The LTC2992’s wide operating range is ideal for many applications, especially 48V telecom equipment, advanced mezzanine cards (AMC) and blade servers. 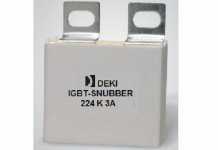 The onboard shunt regulator provides support for supplies greater than 100V and negative supply monitoring. 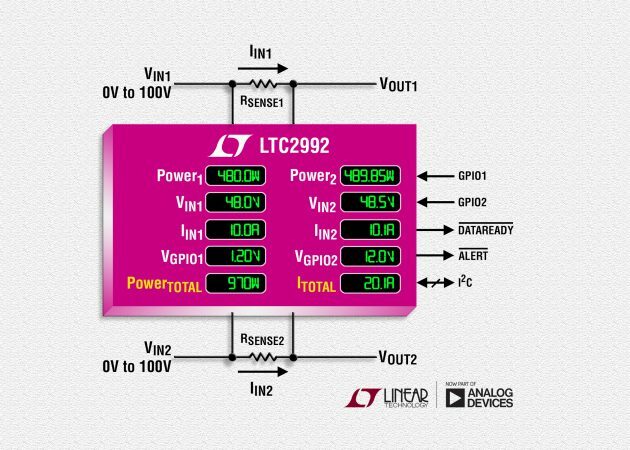 The LTC2992 measures current and voltage either continuously or on-demand calculates power and stores all of this information along with minimum and maximum values in I²C accessible registers. 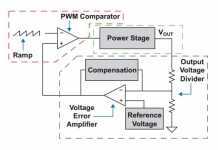 Four GPIOs can also be configured as ADC inputs to measure neighboring auxiliary voltages. Measurements are made with only ±0.3% of total unadjusted error (TUE) over the entire temperature range. 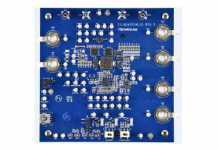 If any parameter trips the user-programmable thresholds, the LTC2992 flags an alert register and pin per the SMBus alert response protocol. 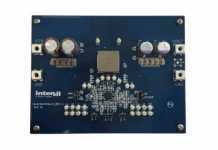 The 400kHz I²C interface features nine device addresses, a stuck bus reset timer, and a split SDA pin that simplifies I²C opto-isolation. The LTC2992-1 version offers an inverted data output I²C pin for use with inverting opto-isolator configurations.